If, being the owner of curly hair, you decided a little cheat nature and to make them straight, remember – there is no safe way of rectification for a long time. Anyway, to make the hair straight, it is necessary to break their natural structure. But as you know, beauty without victims can not do. The easiest way to straighten hair at home is to use raschetka in combination with a Hairdryer. A large round brush and pull the wet hair and lock in this condition with the help of hot air. After the procedure, apply to strands styling. Hair will stay straight for about a day. The second method, available in the home, is the use of a flat iron for hair straightening. The apparatus is heated to a certain temperature, and then, strand by strand, using it processed curly hair. When choosing a flat iron should pay attention to the surface – not to burn the curl, it needs to be ceramic. 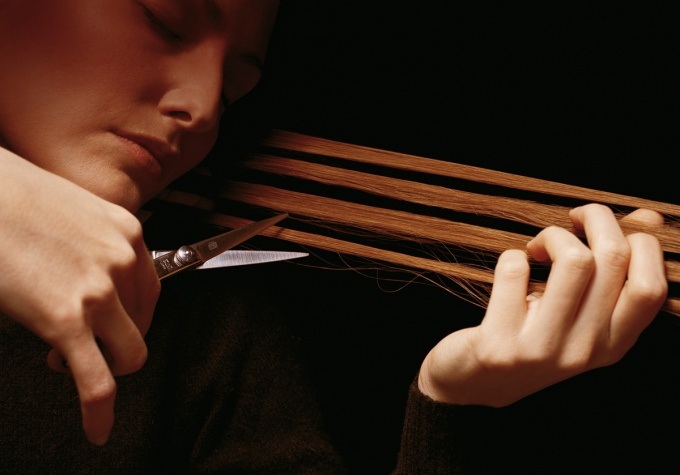 If your hair is twisted only a little, maybe you should try one of the professional means to care for them. Most of today's shampoos, masks, conditioners and balms possess rectifying properties. A more radical method is the straightening in the salon with chemical composition. Hair is handled with chemical substances, penetrating deeply into their structure, thus become straight and manageable. Bio-hair straightening – a new word in the fight against curls. The basis of the method – processing of the amino-acids cysteine, penetrating into the hair shaft and changing its structure, but without affecting the chemical elements. But not in a hurry to run to the hairdresser – this method is not cheap, and its impact on the hair are still not understood. The most natural, but short way is to use natural hair masks. To prepare this mask you will need a mixture of Cup of fresh coconut milk with lemon juice that stood in the fridge before the formation of cream layer. You need to apply this mixture on the scalp and wrap a hot towel. Then the mask should rinse and comb wet hair. If you repeat this procedure for three weeks the hair in a natural way straight. You can use hair straighteners warm oil it to heat up a bit, apply on scalp and leave for a period of 15 to 30 minutes, wrapping your head in a warm towel. Even a perfectly smooth hair will become wavy again, if you find yourself in a room with high humidity. To make the hair more smooth, use a comb with a few teeth – it prevents the fluff of the hair and prevents their splitting. The majority of owners of perfectly straight hair has always dreamed of graceful waves on the hair. What can you do, ladies tend to want updates. Going towards the women inventors invented many ways to change the shape of the hair. With some manipulations it is possible to make at home, and more complex actions you'll do in a barbershop. The simplest and most ancient method to turn a hair in wavy is a simple rod. To do this, take the small strings of cloth, tie in alternating curls and legite to sleep. In the morning you will get small curls but after combing they will be lush and very pretty. The other way is a normal curler. It can be curlers of different kinds – hard, soft, thermal. The size of the curls depends on the shape and size curlers. To get the original curls half up half hair, respectively, and to wind the hair need not completely. However, for more "long-playing" curler to keep as long as possible. Still, the short-lived curls out. For longer preservation of curls, apply to the hair before winding means for fixing. Good and fast option to create curls – these hot rollers. However, you should use them very carefully, so as not to get burned. They warmed up in water for about 10 minutes. Wind hair on curlers such immediately until the rollers have cooled. And after 15 minutes you can enjoy the curls. Another popular course is the use of modern irons. This seemingly simple instrument requires experience and skill. However, the curls are obtained quickly and also, exactly where needed. With this tool it is possible to make only a few curls "reviving" any hairstyle. But it is best to ask someone to help with the hair that you do with the forceps. After all, to manage them quite difficult. The process of home "cooking" of curls use a special mousse, which will facilitate the process. The following methods are best used when the participation of a professional hairdresser. So long a Perm can provide the opportunity to enjoy the curls 6-18 months. Modern perming is quite gentle on the hair. Besides, today there are different types of chemistry. What suits you, tell the hairdresser.